A ham steak is a cut of ham purchased uncooked or smoked. They're generally between 1/4 and 1/2 inch thick. 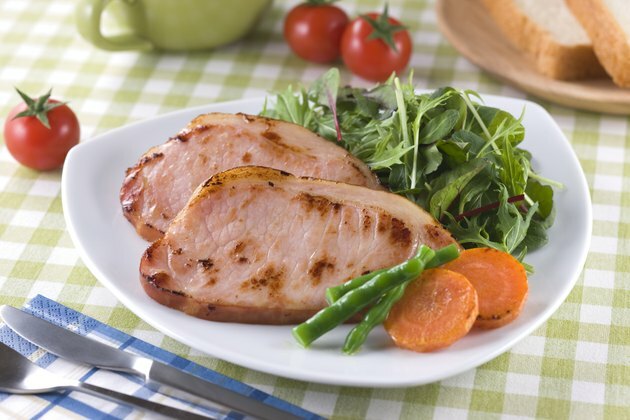 Ham steaks make a convenient meal, especially for one or two people, being smaller, quicker and less complicated to prepare than an entire ham roast or other pork dish. They can be serve as an entree on their own, or cut up and added to a wide variety of recipes that call for a meat addition. The standard way to cook a ham steak is to fry it in a pan on the stove. Trim the skin off the outside of the ham steak with a sharp, non-serrated knife. Leave fat around the edges, and cut slits in it every inch or so with the knife. Pat the ham down with paper towels to ensure it's dry. Preheat 1 tbsp. of canola, olive or other vegetable oil in a large pan over medium-high heat. Exclude the oil if you're frying a particularly fatty ham steak, as it's unnecessary. Rub seasonings onto the ham steak if you're using any or following a particular recipe. Refrain from salting ham steaks, as they're naturally quite salty. Fry the ham steak in the pan over medium heat to be sure the center cooks before the exterior begins to burn. Turn it frequently with tongs or a spatula. Give each side a total of at least six to eight minutes, cooking until both sides are well-browned and the fat is transparent. Remember that cooking time varies depending on the thickness of the ham steak. Remove the ham steak from the pan. Insert a meat thermometer into its center and make sure the internal temperature is at least 160 degrees F. Return the ham steak to the pan and cook longer as needed. After frying the ham steak, trim the fat from the edges before serving for a nicer presentation.